The Boyevaya Razvedyvatelnaya Dozornaya Mashina, literally 'Combat Reconnaissance Patrol Vehicle', better known as BRDM, is an iconic vehicle that has largely been absent from the nearly seven-year long Syrian Civil War. 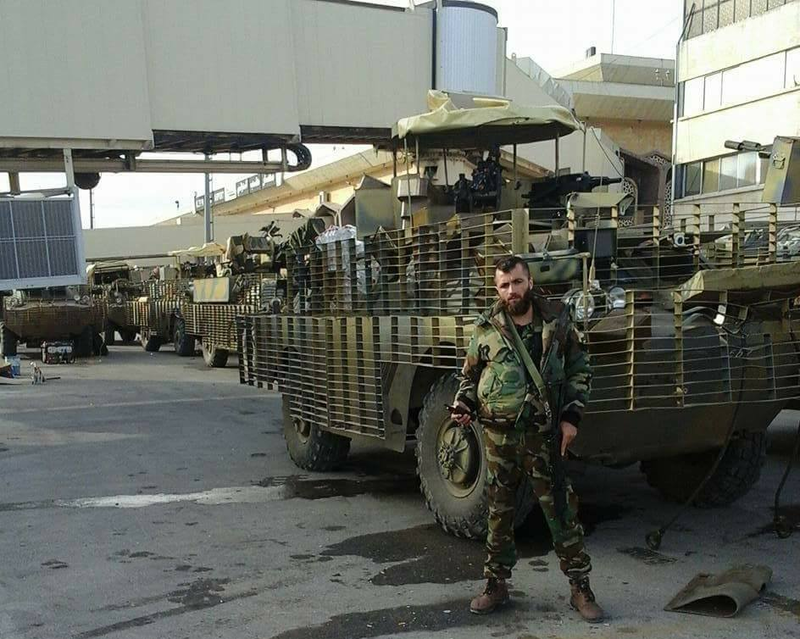 While some analysts following the war continue to expect the BRDM to show up in large numbers at some point in the future, the fate of the vehicle had effectively been sealed after the Syrian Arab Army retired the majority of its BRDM-2s shortly before the start of the Syrian Revolution. Operating vast numbers of armoured fighting vehicles far more suitable for use in the Civil War that followed, only small numbers of BRDM-2s remained in use in recent years, most notably with the Russian Private Military Company 'Wagner' operating throughout Syria. Despite the elusive nature of the vehicle during most of the Syrian Civil War, the BRDM-2 was one of the first armoured fighting vehicles (AFVs) encountered by protesters in the early stages of the revolution. 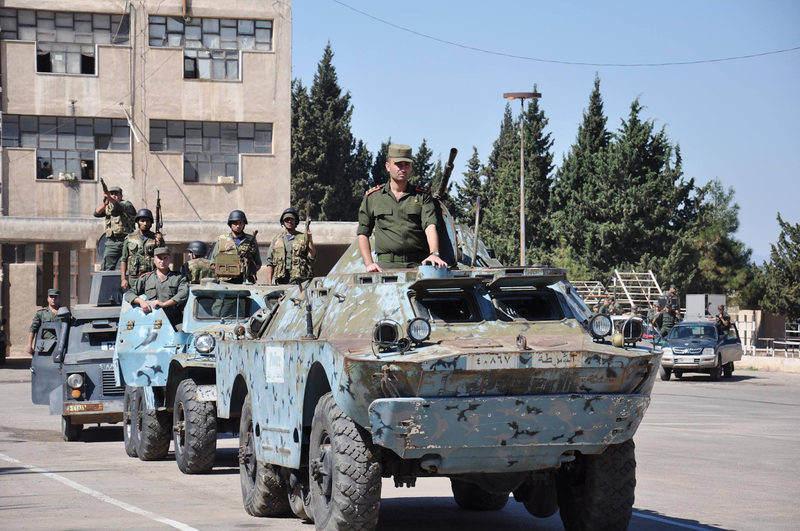 The Syrian Police had previously received small numbers of BRDM-2s and BTR-152s from the Syrian Arab Army (SyAA), and modified some of these with additional armour and a distinct blue camouflage pattern while retaining the 14.5mm KPV and 7.62mm PKT machine guns. These BRDM-2s were deployed in the cities of Homs and Idlib during the early stages of the revolution, resulting in the capture and destruction of several vehicles. 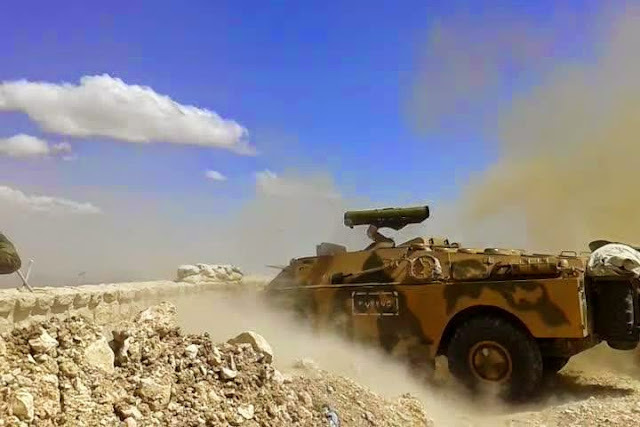 Sporadic sightings of the BRDM-2 in use with the Syrian Arab Army continued in the period that followed, eventually dwindling down to the almost complete dissapearance of the vehicle on the Syrian battlefield. Several BRDM-2s could however seen in footage of captured SyAA bases, where some were used as static pillboxes by the defenders or simply left abandoned in various corners of the base. Repairing these vehicles, almost all suffering from flat tires, was apparently not worth the effort in the eyes of many of their capturers, and most were left to rot in place. Dedicated variants of the BRDM-2 were slightly better off than the original vehicle they were based on, as the majority of these dedicated vehicles, including BRDM-2RKh radiological-chemical reconnaissance vehicles, 9P122 and 9P148 anti-tank guided missile carriers and 9K31 Strela-1 mobile SAM systems, were still in active service during the outbreak of the Civil War. Nonetheless, finding a use for these specialised variants in the Syrian Civil War proved challenging, and government forces only began to employ some of its BRDM-2 9P148 anti-tank guided missile (ATGM) vehicles against enemy hardened structures in 2014. This usage appeared to have been limited however to a few vehicles however, and most dedicated BRDM-2 variants remain in storage today. 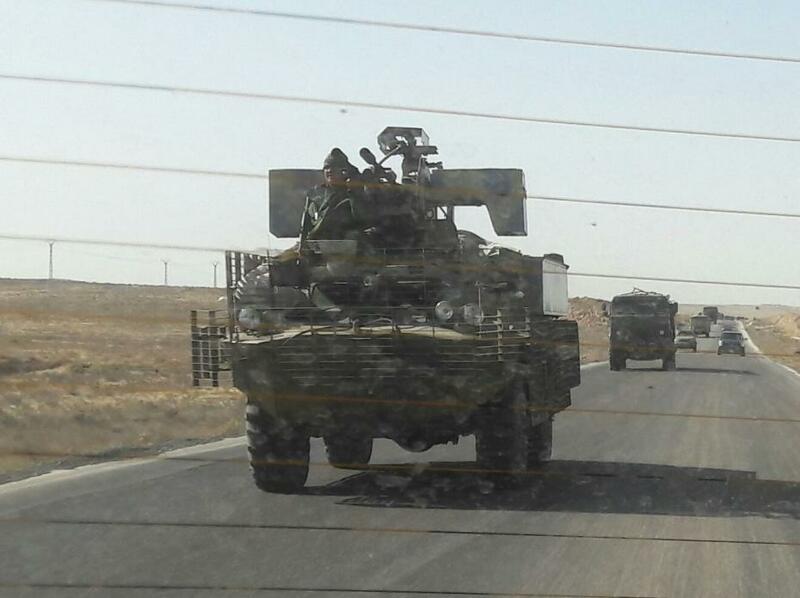 Although the number of BRDMs delivered to Syria remains somewhat of a mystery, and like all deliveries of armoured fighting vehicles to Syria have been subject to high inflation, the amount is believed to be limited to a few hundred, including the various specialized variants delivered over the years. Attrition might not have spared the BRDM-2 as much as it did other vehicles in SyAA service, with only limited numbers still in active service in the late 2000s. Despite having entered service with several neighbouring countries, reports detailing the usage of earlier BRDM-1 variants by Syria are believed to be incorrect. Syria first used its BRDM-2s and 9P122s ATGM carriers during the 1973 October War (known in Israel as the Yom Kippur War), facing off against the Israeli Army entrenched in the occupied Golan Heights. Several were lost or captured to the Israeli Defense Force, which eventually got hold of enough BRDM-2s and 9P122s to employ and modify these vehicles for their own use. Ironically, some of these BRDM-2s were then employed against their former owner in Lebanon during the 1982 war, which also saw the widespread usage of BRDM-2s by the SyAA and allied forces. At the turn of the century, the useful career of most BRDM-2s had effectively ended. Lacking the modern sighting systems and heavier armament reconnaisance vehicles are nowadays associated with, the BRDM-2 was hopelessly outdated in for the original role it was designed for. While many African countries continue to operate the BRDM-2 as a light armoured fighting vehicle, the usefullness of such a vehicle against Israel, undoubtedly the only possible enemy for Syria till the start of the Civil War, was deemed very low. Unsurprisingly, most vehicles that remained in service were retired by the SyAA's mechanized units that continued to operate the type. However, the fate of a limited number of vehicles would eventually be ressurected by after being transferred to the police along with even older BTR-152 armoured personnel carriers (APC). 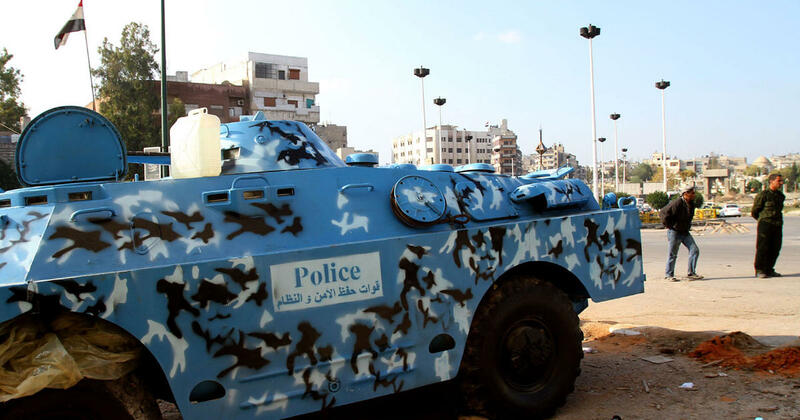 While the BRDM-2 has the potential to be quite effective in this role, and was modified by several police forces around the world as succesfull anti-riot vehicle, Syrian modifications quickly proved to be entirely inadequete as peaceful protests quickly turned into a Civil War that still spans on today. Completely inadequate for peaceful riot control with its heavy armament, and often resorting to the use of its machine guns, the remaining vehicles were withdrawn after miltary forces took over the remaining operations of police forces. The plaquette on the side of the BRDM-2 reads: قوات حفظ الأمن والنظام - 'Forces of maintaining of order and security'. 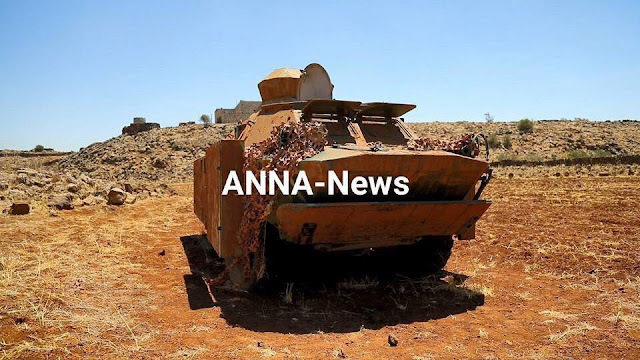 With the Syrian Arab Army now in control of quelling the revolution, still often contained in large cities such as Homs, the presence of heavier armoured fighting vehicles on the frontlines increased, including several BRDM-2s mostly placed at checkpoints around rebel hotspots. 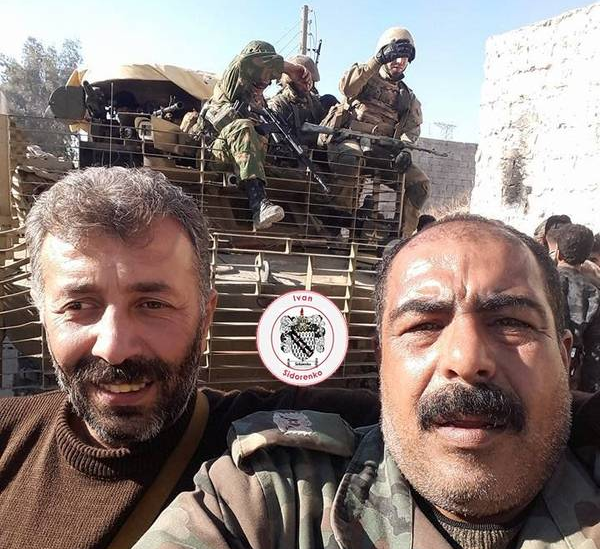 However, being prepared against to fight a conventional war with Israel, and proving completely inapt at adapting to the rapidly changing battlefield in Syria, the SyAA's tanks did little to reinforce the government's rule in urban centers. With the fighting expanding to much of Syria, so did the intensity of the conflict. Rebel groups, now armed with ATGMs and RPGs captured from SyAA stocks or received from abroad, wrecked havoc on SyAA armour. While armour losses of the Syrian Arab Army increased to numbers far surpassing the fleet of tanks operated by most countries in the world, the SyAA, being prepared to fight a conventional ground war against Israel, could still rely on large numbers of armoured fighting vehicles to replace its huge losses for much of the war. 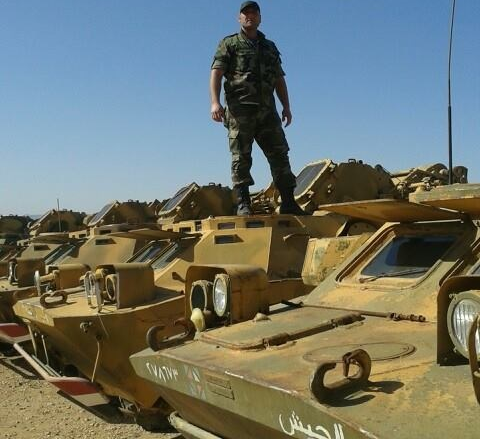 The fact that large numbers of T-62Ms and other AFVs to replenish some of the SyAA's lost inventory only began to arrive by early 2017 is a testimony to Syria's well-stocked armories. 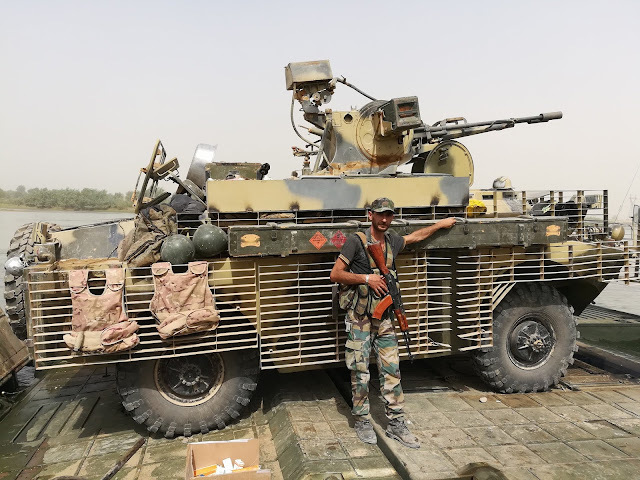 This however also meant that there was no real reason to reactive and employ lightly armed and lightly armoured AFVs like the BTR-60 and BRDM-2 that had been rotting away on SyAA bases since years. Often still armoured with a 14.5mm heavy machine gun and providing protection against small arms at best, some BRDM-2s were instead employed as static pillboxes by (besieged) army bases facing to be overrun. 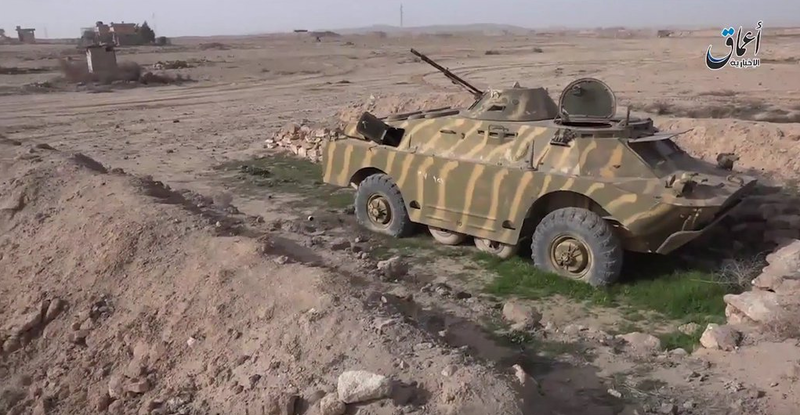 Several of these were then captured after the fall of these bases, most notably by the Islamic State during its conquest of SyAA military garrisons in 2014, such as the derelict BRDM-2RKh captured at Raqqa's Division 17 and another regular BRDM-2 near Deir ez-Zor. Fearing better slightly better than the regular BRDM-2 was the SyAA's fleet of anti-tank guided missile (ATGM) carriers based on the ubiquitous BRDM-2 chassis, which due to the heavy profileration and usage of ATGMs in the Syrian Civil War could have ended up as a force multiplier during the many government offensives throughout Syria. Although orginally designed to be used against AFVs, ATGMs have seen widespread usage as a precision weapons against hardened structures such as defensive emplacements in buildings. While unable to set up positions in stealthy locations like a regular ATGM launcher can, the major advantage of the BRDM-2 based ATGM carriers is ability to fire five or six ATGMs (depending on the type of vehicle) before having to reload all while the crew remains in cover inside the vehicle. 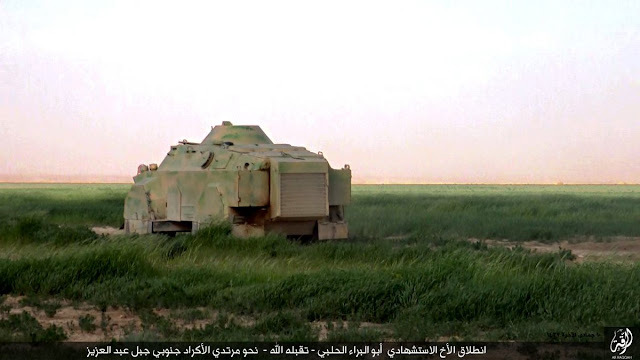 This ability could have been of great benefit regime's push through Islamic State-territory in Syria's desert region, where the Islamic State made heavy use of both non-armoured and armoured vehicle-borne improvised explosive devices (VBIEDs). 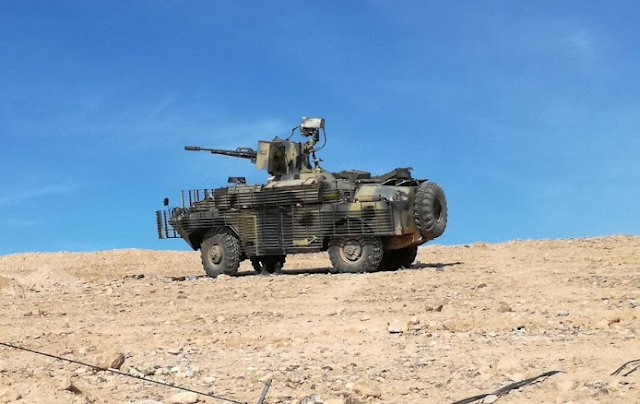 Several of these managed to succesully sneak up on SyAA positions and troop concentrations, which could likely have been prevented by a mobile BRDM-2 based ATGM carrier in overwatch position. Having received both the 9P122 and the more modern 9P148 ATGM launchers, it can be argued that only the 9P148 still has capabilities of use in a modern conflict. The 9P148 can fire both the 9M113 'Konkurs' and the older 9M111 'Fagot' and is a considerable improvement over the older 9P122, still firing the older generation Malyutka ATGM. Although small numbers of the 9P148 were employed during the Civil War and are still believed to see limited service, all 9P122s remain in long-term storage. In their intended role of striking Israeli Merkava tanks on the Golan Heights, the 9P122 and its Malyutka ATGMs would not have feared well anyway. Although most 9P122s remain hidden from sight sitting in SyAA army bases, several would be captured by over the course of the Syrian Civil War, most notably a total of seven 9P122s captured in the Artillery Academy during the rebel's attempt to lift the siege on Aleppo, which they succeeded in early August. Despite their repeated attempts at maintaing a life line vital to rebel-held Aleppo, renewed regime offensives reinistated the siege in early September 2016 while taking control of the whole city several months later in December 2016. 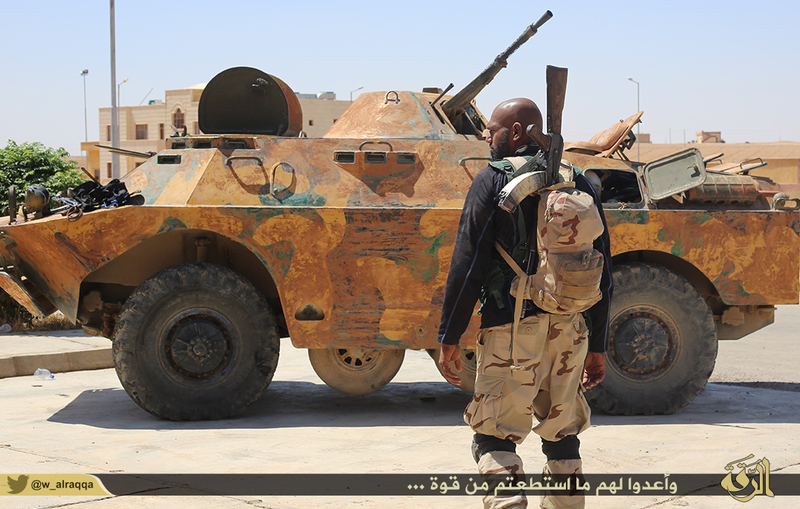 Interestingly, only the Islamic State would attempt to make use of its captured 9P122s. 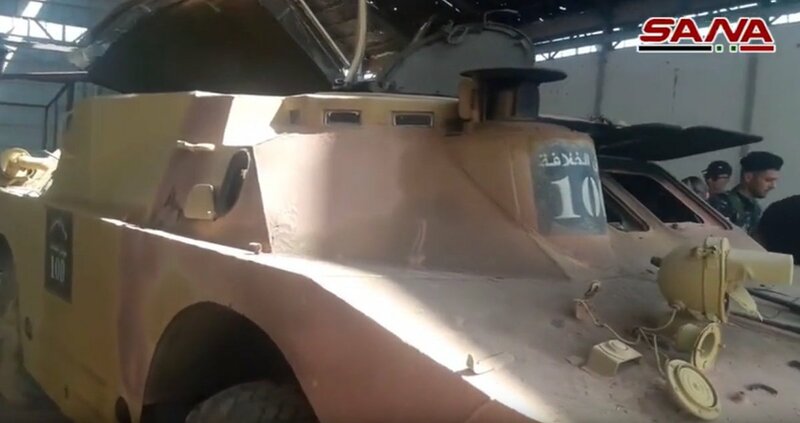 However, instead of employing the vehicle in its intended role, it is likely that the Islamic State converted these vehicles either to an APC or a VBIED before 9P122 '100' and '106' were captured by regime forces near Ayyash, Deir ez-Zor. 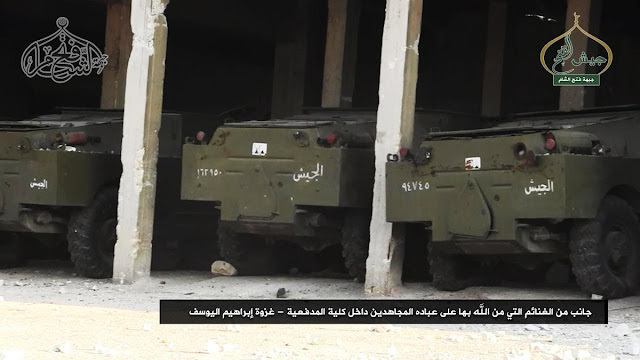 Both 9P122s captured had black square markings reading: الدولة الإسلامية - 'Islamic State', جيش الخلافة - 'The Caliphate Army' (Jaish al-Khilafa), indicating the vehicle had been overhauled by the Islamic State's 'The Workshop' armour repair center or one if its satellite workshops. As each vehicle category received its own first digit, the capture of 9P122 '106' indicates that at least six BRDM-2, its derivatives or other wheeled AFVs were overhauled by 'The Workshop'. A similar fate of most other 9P1222s was also bestowed on the 9K31 Strela-1, a short-range surface-to-air missile (SAM) system based on the chassis of the BRDM-2. In essence providing the same capabilities as an older generation MANPADS on a mobile platform with four missiles, the 9K31 Strela-1 would likely have been completely outmatched by current countermeasures against IR-missiles in today's conflict. Having received more modern Pantsir-S, Buk M2 and upgraded S-125s (Pechora-2M), themselves already outmatched by the Israeli Air Force, Syria appears to have retired most of its its 9K31 Strela-1s in the late 2000s or early 2010s. While most dedicated variants of the BRDM-2 continue to remain in storage, the occassional appearance of BRDM-2s continues until this day, yet almost always of a single vehicle in use by either the government-linked forces or one of the factions fighting against it. Tellingly, most of these sightings were of BRDM-2s operated by factions fighting against the Syrian regime and its allies, most notably by the Islamic State, which used several BRDM-2s during its operations against the isolated Syrian Arab Army bases in Northern Syria. 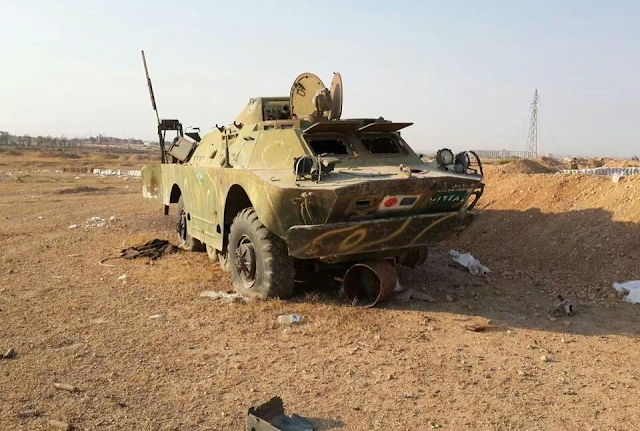 It appears that most active BRDM-2s operating on the side of the government were reactived on the initative of the unit operating them, and not as part of a wider programme to reactive a larger portion of the BRDM-2 fleet in one of the regime's armour repair workshops. On the other end of the spectrum, factions like the YPG relied on reactivating vehicles like the BRDM-2 to give its forces at least some form of armoured support. 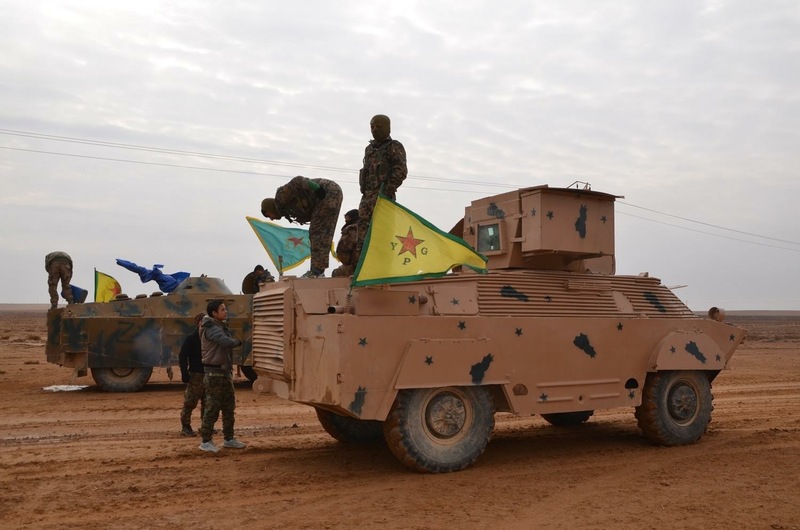 Historically being the least rich in armour of all major factions fighting for control over Syria, the YPG made use of any vehicle they could get their hands on in order to supplement their hodgepodge of DIY armoured tractors and other monstrosities. 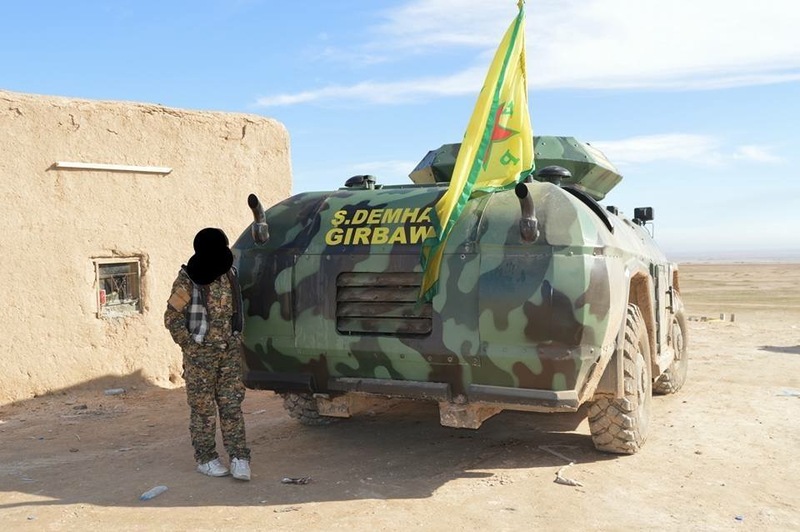 This led the YPG to reactive several BRDM-2s along with BTR-60s previously abandoned by regime forces or other factions throughout Northern Syria. 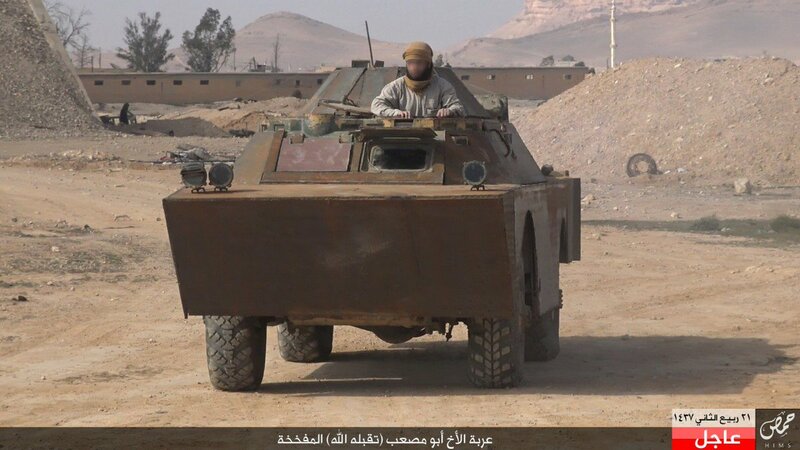 More recent sighting included one BRDM-2 formerly operated by Jaish al-Islam in Eastern Qalamoun before being handed over to regime forces intact along with roughly 40 tanks and AFVs in April 2018. Interestingly, although having established its own air force during the initial stages of the war, operating several 9K33 Osa SAM systems in Eastern Ghouta, having collected the largest concentrated force of armour in Syria and being in the possession of more than twenty Iranian Zelzal-2 'Maysalun' artillery rockets with a range over 200km, Jaish al-Islam never used its assets to their full potential. Instead, Jaish al-Islam appeared to have used its captured equipment mainly as a deterrent rather than utilising their full potential in the Civil War, ultimately failing to reap the benefits of both. While several of the tanks handed over to regime forces by Jaish al-Islam were later seen taking part in the Daraa offensive several months after being handed over to them, it remains unknown if the BRDM-2 will see any future use as well. 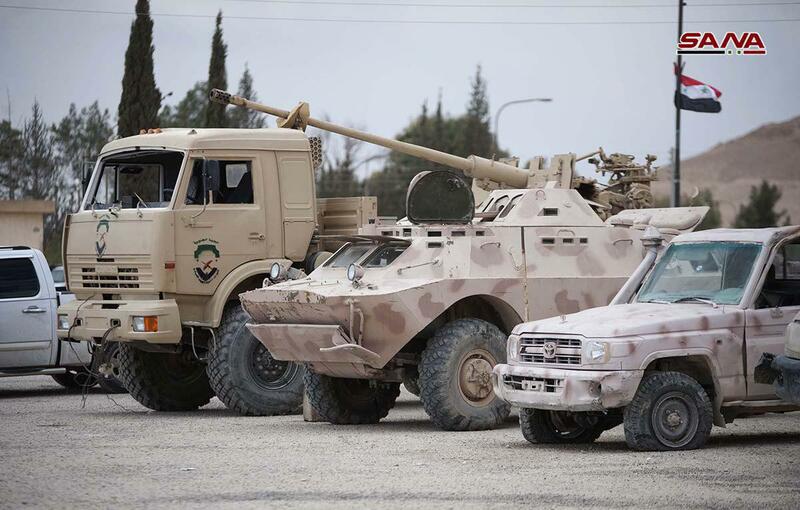 Other users that actually intended on deploying its BRDM-2s to the battlefield would also modify their vehicles, mainly seeking to increase the protection of the vulnerable wheels to enemy small arms fire similar to the modifications applied to the BRDM-2s operated by the Syrian police. These often relatively simple modifications would do little to protect the vehicle against anything other than bullets, but this was likely considered adequate for the limited roles the BRDM-2 would often be tasked with. Typical modifications applied to such BRDM-2s can be seen below, vehicle) heading off to a VBIED attack. The text bar reads: انطلاق الأخ الاستشهادي أبو البراء الحلبي -تقبله الله - نحو مرتدي الأكراد جنوبي جبل عبدالعزيز - ''Martyrdom-seeking brother Abu al-Baraa' al-Halabi -may Allah accept him - moving towards the apostate Kurds south of Abdulaziz Mountain.'' While slat armour would have significantly increased the vehicle's chances against rocket propelled grenades (RPGs), this was likely deemed not worth the effort by its operators. 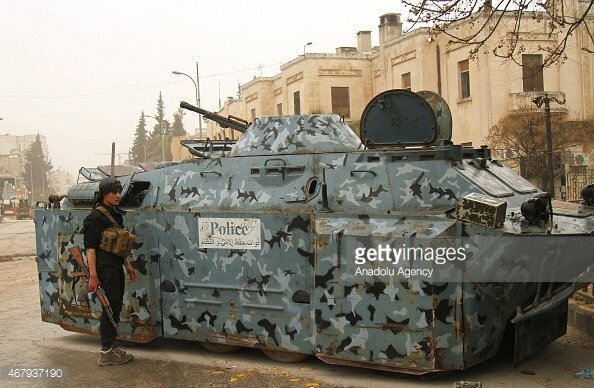 Indeed, only a relatively small amount of AFVs have received this form of armour protection throughout the Syrian Civil War, most notably the AFVs operated by the 4th Armoured Division. Relatively few BRDM-2s received increased armour protection offering at least a chance against heavier weaponry such as RPGs and ATGMs, which would otherwise go right through the armour of a BRDM-2. 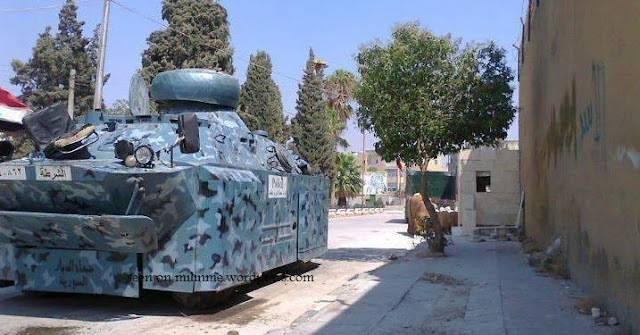 One such example in Daraa can be seen below, where this particular vehicle was captured by the regime forces. This particular vehicle was modified with a new turret extension on top of the BRDM-2's already existing turret and armour plates presumably filled with rocks or sandbags bolted onto the side of the vehicle for increased armour protection. 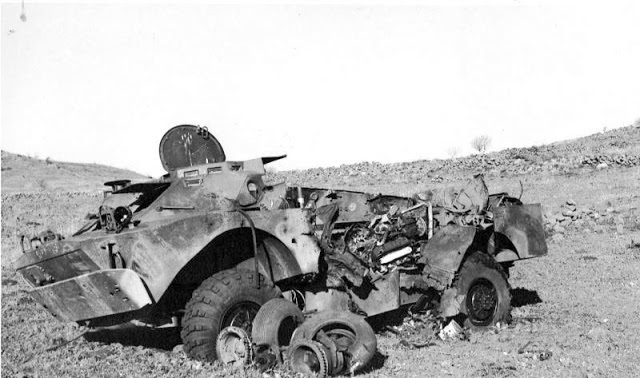 Not all AFVs captured on the battlefield are completely salvageable however. A damaged turret or a lack of traditional means to replace defective parts can result in a tank that is still able to either drive or shoot, yet is completely useless in its intended role due to its defective armament or engine. 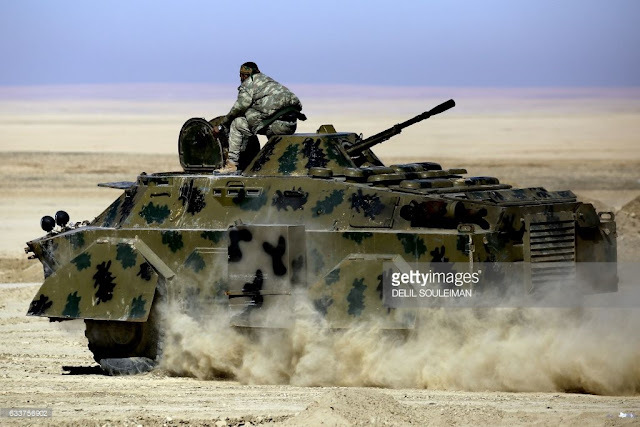 While in Syria this more than often means that the AFV will be written off, the YPG generally refuses to let these scarce armoured platforms go to waste, and DIY AFVs on the basis of another AFV are a common sight. In true YPG fashion, at least one BRDM-2 was used as the basis for a new AFV and extensively rebuilt. Although clearly based on the BRDM-2, its reincarnation differs from the original vehicle in almost every aspect. Most YPG conversions would be more conventional however. The first upgrade consists of armour plates fitted around the wheels, which appear to vary between each vehicle modified vehicle, likely indicating that each BRDM-2 was upgraded by a different armour repair workshop. This vehicle also had a new muzzle flash suppressor installed on its 14.5mm KPV. Another BRDM-2 had its turret replaced by one more reminiscent of the one installed on the M1114 Humvee while retaining its 14.5mm KPV. Additional armour protection and a desert camouflage pattern completes the upgrade. 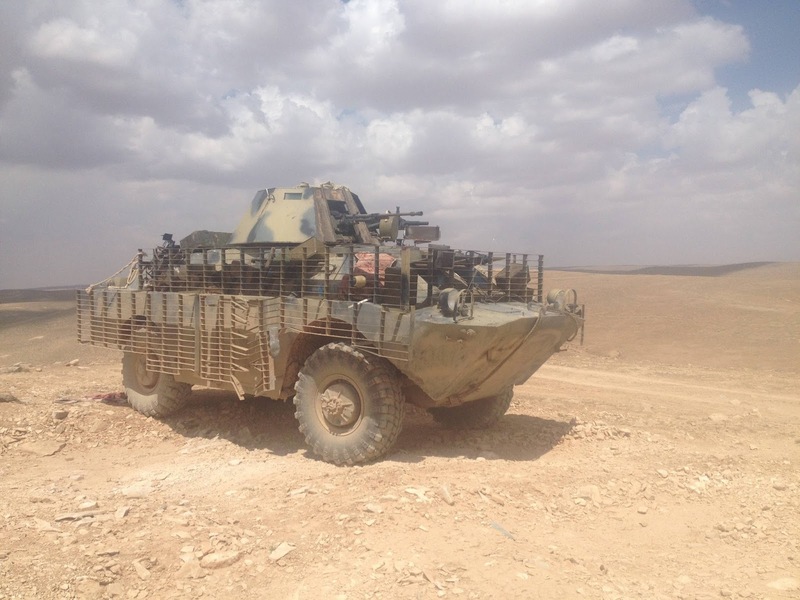 The most intensive upgrades performed on BRDM-2s in Syria would however not be done by any local faction, but instead by the Russian private military company Wagner. Although supposedly a private military company, Wagner has acted as the Russian Ministry of Defense's unofficial comventional force on the ground, and has received extensive support from the official Russian military in Syria. In turn, it has played crucial roles during several regime offensives, acting as shock troops and doing much of the fighting, only to disappear again when cameras in the newly conquered areas start rolling. Although the origin of Wagner's BRDM-2s is unknown, it is possible that they came from SyAA stocks and were modified by their new operators in Syria, or that they were simply acquired from Russian Army stocks and modified in Russia. Three variants are known so far, with several subvariants each, which have showed up in most corners of Syria, including Aleppo, Tadmur and Deir ez-Zor, where at least one was destroyed by the Islamic State. Also note the camera-shy Wagner soldiers in the image below. The first conversion included the removal of the BRDM-2's turret and a remotely controlled 23mm ZU-23 was installed instead, for which a camera was placed on top of the ZU-23. To allow the vehicle to fire for longer periods of time before reloading, larger magazines were installed, likely allowing for more the double of ammunition for roughly 100 rounds per gun (although not all BRDM-2s with ZU-23s appear to use such magazines). The vehicle is also protected by newly installed slat armour around the body and turret. The wide gap between the slat armour and vehicle also allows for the fitting of numerous sandbags, further increasing the chance to deform incoming warheads. Another version had its 14.5mm KPV turret replaced by a homegrown replacement ne containing a 12.7mm NSV and 30mm AGS-17 automatic grenade launcher. This vehicle is also equipped with slat armour, albeit installed slightly different than on the example seen above. Another modification fielded looks much like the previous variant, but features some small differences. Most notably, it doesn't feature an enclosed turret, with an open cupola housing the main armament instead, which however remains unchanged from the variant with an enclosed turret. The vehicle, along with most other Wagner BRDM-2s, also comes with a camera installed on the front of the vehicle, which provides the driver with an increased field of view as his view is largely obstructed by the newly installed slat armour bars. The overhaul of these BRDM-2s turn an otherwise mediocre armoured fighting vehicle into a potent AFV well-suited to travel and patrol Syria's desert regions. It depends on the willingness of the Syrian Arab Army and its allies to make such modifications themselves, and that decision will have a large impact on the BRDM-2's future in Syria. 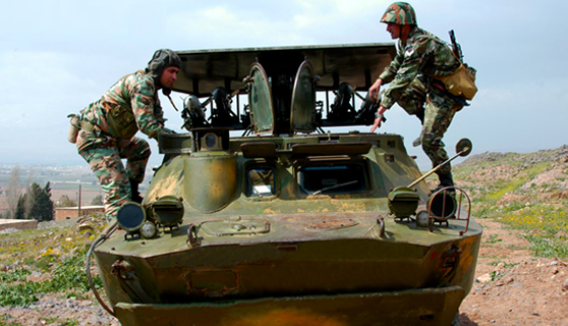 The BRDM-2, despite its numerous weaknesses, can still turn out to be valuable asset in the Syrian Civil War: upgrading them along the lines of Wagner's upgrades will turn them into effective patrol vehicles and fire-support vehicles. As the Syrian government is slowly mopping up what's left of the rebel presence inside Syria and its neighbourhoods, it will undoubtedly set it eyes on territories not yet under its control. Future operations undertaken will likely continue to see the involvement of vehicles once presumed to have found their final resting place that are now being refurbished to fight once more. You are sure to have noticed a lack of content this past year. This is because we were fully committed to finishing our book on the North Korean military by the title of The Armed Forces of North Korea, on the path of Songun, which deprived us of most of the time normally spent on writing articles for Oryx Blog. Regular posting is expected to resume this month. We thank you for your patience, and look forward to finally releasing the culmination of years of extensive study of the DPRK and its armed forces. 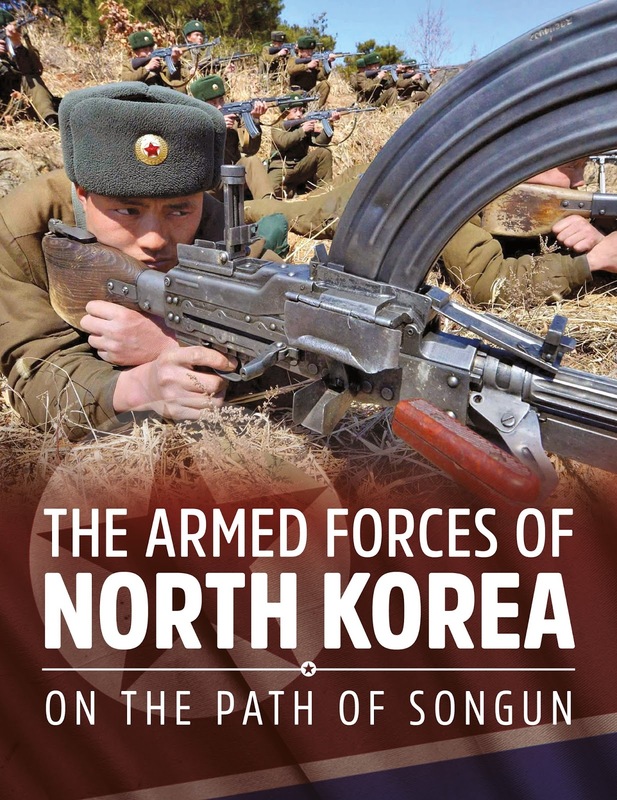 ''North Korea’s Armed Forces: On the path of Songun seeks to bring order and coherence to the chaotic state of affairs in the intelligence community of North Korea-watchers, as well as to disprove the much-echoed stance that there is little to fear from the DPRK by providing information on a plethora of never-before described weapons systems and modernisation programmes. North Korea’s Armed Forces maps the most important events from the inconclusive ceasefire struck at the end of the Korean War, throughout the Cold War until modern day, and an especially heavy emphasis is placed on the current status of the Korean People's Army branches by examining their wealth of indigenously designed weaponry. In the course of the book not only will many of the Korean People's Army’s projects and tactics be unveiled, but also new light will be shed on the deadly flare-ups between the North and the South, and novel evidence on tragic incidents such as the Cheonan sinking and Yeongpyeong bombing of 2010 is brought forth. Moreover, an up-to-date, comprehensive listing of the equipment holdings of several branches of the Korean People's Army is included, offering a numerical assessment of its naval and aerial capabilities. From the recently introduced stealth missile boats, ballistic missile submarines and main battle tank families to their often-ignored indigenous aircraft industry, virtually all indigenous weapons systems are discussed extensively. They are indeed most often seen with the special units of the ministry of interior. Though again it is usually in platoon sized groups. But it depends on where these interior ministry forces are located. If it's units manning static positions in Damascus as was the case with one inspected unit, vehicles of any kind are rare. If it's interior ministry units being sent to respond to a battle as was the case with Al-Qaryatayn you may see btr 152s and brdm-2s. There might be some next to the Hama ( or Homs, I could be mistaken of the location ) Ministry of Interior run Cafe called CSKA if that is still a thing. I’m very excited for your book! You or your publisher should inform Amazon of the upcoming (November 21?) release and have them set up a page for pre-orders. I love your writing and hope your book sells very well. If you have any difficulties you can publish it in the US as ‘The Girl With the Armed Forces of North Korea Tattoo’.